Our beloved friend and partner, Philip A. “Phil” Harley, passed away peacefully on Thursday July 2, 2009. Phil spent his last moments at home, in the company of his loved ones, his husband Mark Kalend, their daughters, Sara and True, and Phil’s mother and brothers. Philip A. Harley was a nationally recognized and certified civil trial specialist focusing in the areas of asbestos, toxic-related cancers and catastrophic injury. In 1990, Mr. Harley’s trial practice began to focus on toxic diseases and other catastrophic injuries. He believed his knowledge and skills were best used to assist those who had been the most severely impacted by corporate misconduct. Mr. Harley is widely recognized by both the Bar and the Bench for his outstanding trial advocacy. Since 1990, his clients obtained more than 100 jury verdicts, with many in excess of $10,000,000. 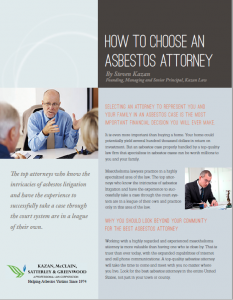 In addition, Mr. Harley and Kazan Law have successfully litigated a variety of bankruptcy-related issues to help the most seriously injured receive a greater share of bankruptcy assets through programs like the Western Macarthur Asbestos Trust and other bankruptcy compensation trusts. Notably, Mr. Harley and his prior law firm assisted in defeating the Combustion Engineering pre-pack bankruptcy, which failed to protect seriously injured asbestos victims.